J.P. Losty is an internationally recognised authority on Indian painting and has published many books and papers on various aspects of the painting of Indian from the twelfth to the nineteenth centuries. His major books include the Art of the Book in India (1982), Calcutta city of Palaces (1990). The Ramayana (2008). Indian Miniatures from the James Ivory collection (2010). 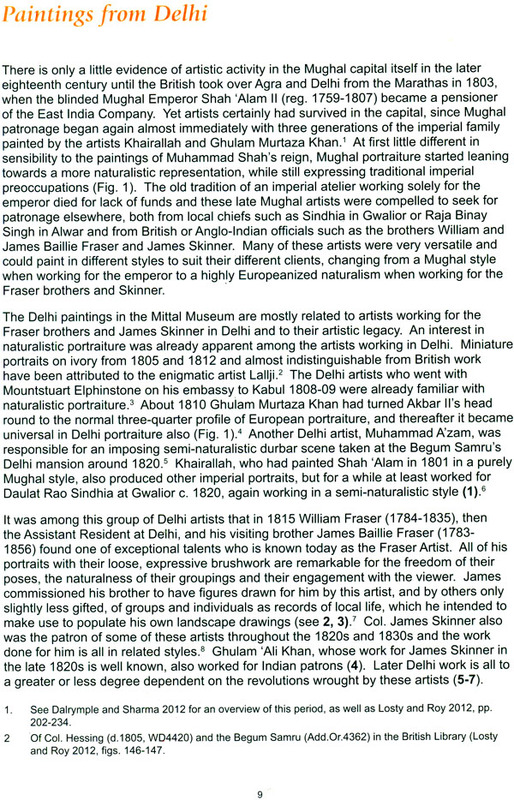 Delhi from Red Fort to Raisina (2011), Mughal India: Art, Culture and Empire (2012) jointly), and Sita Ram: Picturesque Views of India (2015). He is currently working on a book that will survey the whole of Indian painting in the British period . Jagdish MittalJagdish Mittal is an artist turned collector and art Historian. He is the Principal Trustee of the Jagdish and Kamla Mittal Museum of India Art’, to which he and his wife, Kamla, gifted their unique art collection in 1976. He was awarded the Padma Shri by the Government of Indian in 1990. His research articles have been published in prestigious publications on Indian art. His Books include: Andhra Paintings of the Ramayana (1969); Sublime Delight Through Works of Art from the Jagdish and Kamla Mittal Museum of Indian Art, Hyderabad (2007) (hereafter JKMMIA); Bidri Ware and Damascene Work in the JKMMIA (2011); and Deccani Scroll paintings in the JKMMIA (2014). He is co-author with John Seyller of Several museum catalogues: Pahari Drawings in the JKMMIA (2013); Mughal Paintings, Drawings and Islamic Calligraphy in the JKMMIA (2013); and Pahari Patintings in JKMMIA (2014). He is co-author with Milo C. Beach, Andrew Topsfield et al. 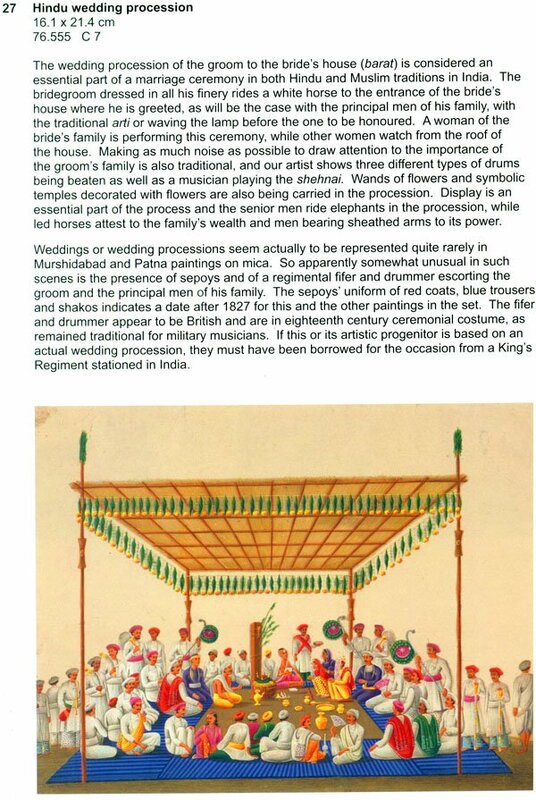 Of Rajasthani Paintings in the JKMMIA (2015) and with Andrew Topsfield Rajasthani Drawings in the JKMMIA (2015). He is a collaborating with John Seyller on a forthcoming museum catalogue of Deccani Paintings. Drawings and Manuscripts. I saw a 'Company Style' painting for the first time in July 1945, when I joined Kala Bhawan, Santiniketan, to study painting. On the first day of the class, the principal, Shri Nandalal Bose, instructed me to copy an old painting that he said was a 'Lucknow' bird, by which he meant a work produced at Lucknow for the British. It was executed in a gouache technique in a bold style, and depicted a bird perched on a tree branch. 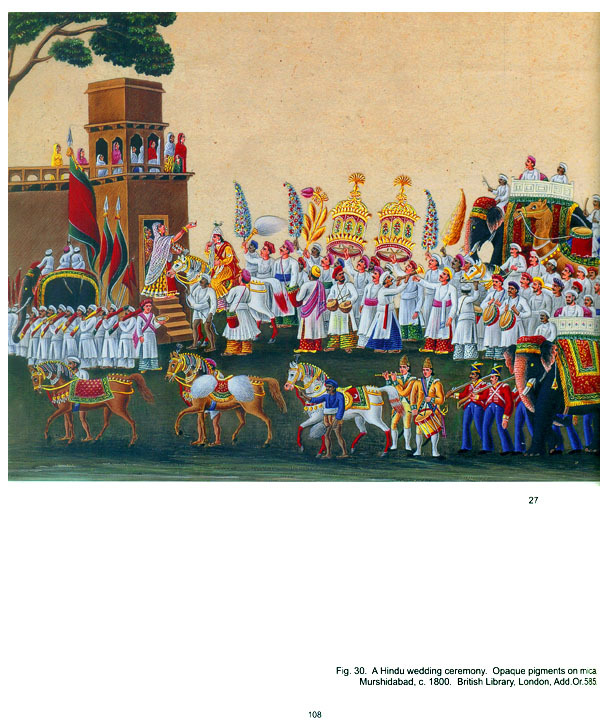 The term 'Company Painting' that is now generally used to describe Indian painting of the British period was not known to scholars in the 1940s. These works were made by Indian artists from the 1760s, chiefly for the British, well into the 19th century, when the class of patrons expanded to include Indian princes and merchants. The nomenclature 'Company Style' was coined in 1942 by the late Rai Krishna Das, the doyen of Indian art, in his Hindi book Bharatiya Chitrakala. I first saw reproductions of works in this style in Mildred Archer's Patna Painting, published in 1949. I visited the exhibition The Art of India and Pakistan, which, after it was shown at the Royal Academy of Arts, London, in 1947-48, was displayed at the Rashtrapati Bhavan, New Delhi, in 1949. It was the most comprehensive assembly of all forms of Indian art. Its , painting section included masterpieces of all styles of miniature paintings, works of British artists in India, and Modern painting. 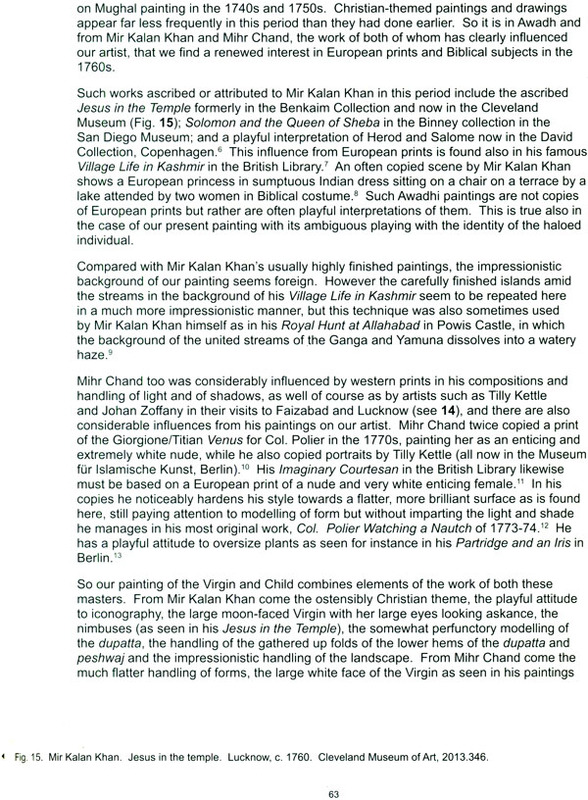 In recent years, when I referred the catalogue of this exhibition, published in 1950, and saw the list of paintings, I was surprised to note that Indian paintings of the British period were not included, although fine examples of works in this style were already in London museums, and with the descendants of the British officials who had commissioned them when they were in India and had taken them to England after retirement. In fact, art lovers of Indian painting became aware of these works only in 1954, when Indian Painting for the British by Mildred Archer and her husband, W.G. Archer, was published in London. This book provided a great amount of information about the artists of these works and their patrons. Between 1954 and 1992, Mildred Archer published several books and articles on this subject (see bibliography). Some paintings published in them fascinated me. Subsequently, I and my late wife, Kamla, used to admire some of the works done by Indian artists for the British. We were never constrained by the particulars of the period, style, or theme of a given painting, and savoured a work of art if it was distinct in style, original in expression, and aesthetically satisfying to us. 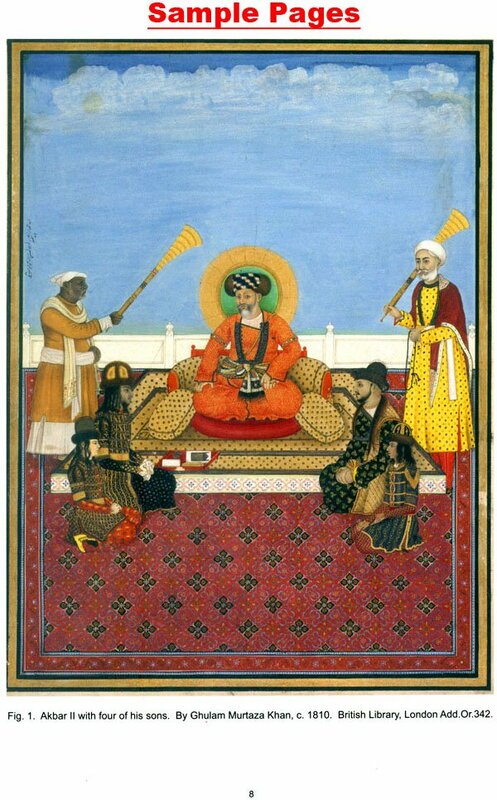 I know that many scholars and collectors of Indian painting do not appreciate this unique cultural hybrid of India and Europe, but these paintings were done at a time when commissions to Indian painters had dried up considerably due to the declining resources of rulers of that period. Moreover, due to the meagre payment given to painters, their work had a tendency to become repetitive, anaemic, and technically deficient. The works of this phase for Indian patrons reflect the contemporary decay in the cultural and social life of the people. At this time, some British patrons with the social position, financial means, and love for art provided much-needed sustenance to painters. Moreover, when they introduced European painting styles to them and commissioned works with innovative themes, a new style of painting with a charm of its own was born. Indian painters not only absorbed the European style, but added something of their own sensibility to it. Indian rulers and ruling classes at Lucknow, Delhi and the Punjab also commissioned work in this hybrid style. Paintings often became large in size, and the use of European papers and colours became common. These works had such varied themes as natural history studies of birds, animals, and flowers, topographical views of monuments and scenery, and ethnographic depictions of the customs and occupations of people. In many cases they are distinct in style and original in composition, and often achieve a high level of technical excellence. When I searched for good paintings in this style, I realised that most paintings of this type had been taken back to Britain by the very officials who had commissioned them and were therefore not to be found in India. I discovered that the number of good examples was only a small part of those made for minor British officials, who used to send them as souvenirs to their friends and families in England. 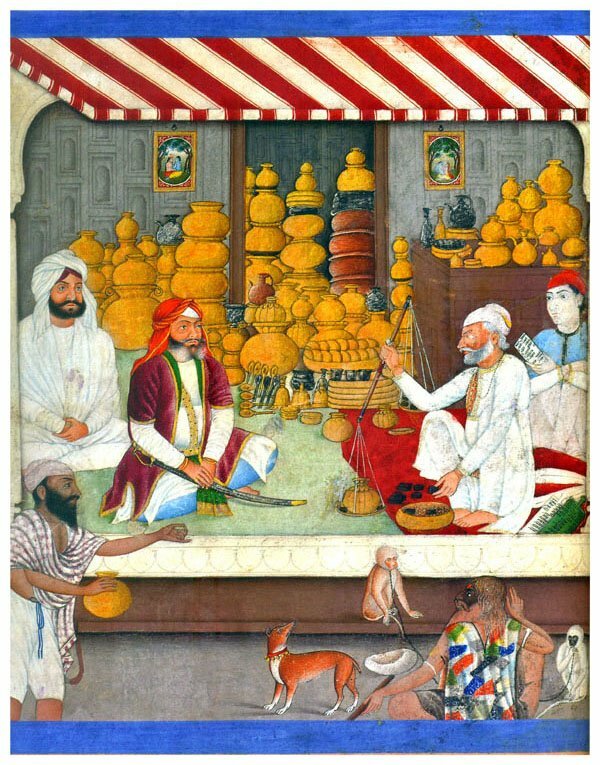 These works on paper and mica depicted everyday life, festivals, birds, animals, and the monuments in India; their quality depended in large part on the amount paid for them In 1961, I was fortunate to be able to acquire in Varanasi a fine work: Shuja 'al-Daula, the Nawab of Awadh, with Ten Sons (cat. no. 14). 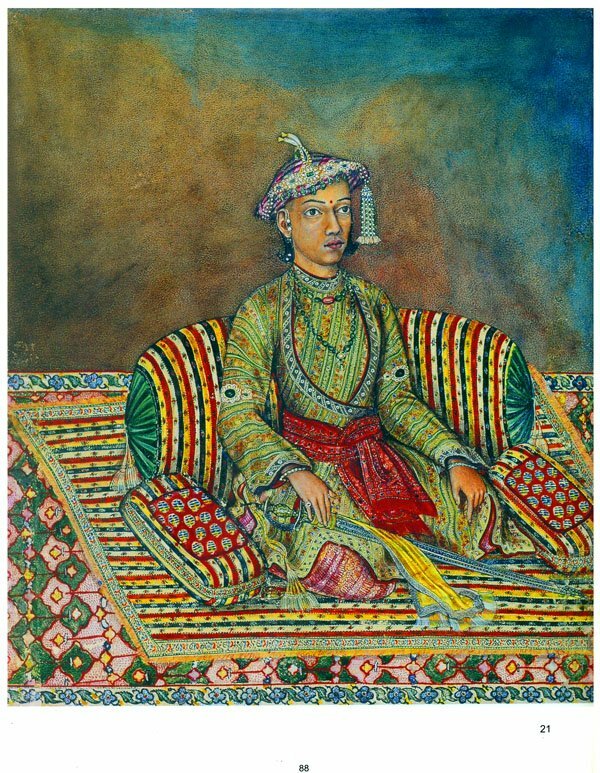 Subsequently, I managed to get a few good examples that were painted for Indian princes and merchants by the same artists used by the British officials. If there had been an opportunity to buy good works of this style in India, I would have certainly acquired paintings by more of the masters of this style: Sita Ram of Murshidabad and Calcutta; the Calcutta artists Sheikh Zain-al-Din and Sheikh Muhammad Amir of Karayya; the Patna painter Sewak Ram; the Delhi artists Muhammad Azam, Jiwan Ram, Ghulam Murtaza Khan, Mazhar Ali Khan, Ghulam AIi Khan, and the still unidentified Fraser artist; and the Punjabi painter Imam Bux Lahori. In 2006, the Trustees, especially the late Naozar Chenoy, Trustee-Secretary of the Museum, decided to publish separate catalogues of each category or style of works in the Museum. This is the ninth publication in this series. Assembling this collection and producing the catalogue have required the sustained efforts of a number of people. Foremost among them is my late wife, Kamla, who always shared with me the thrill and aesthetic delight that came from the acquisition of each work in the Museum. My profound thanks to John Seyller, who enthusiastically agreed eleven years ago to co-author with me several catalogues of the Museum. His work has inspired other scholars to collaborate with me as well. It was he who convinced J. P. Losty (Jerry), the co-author of this catalogue, to become involved in this project. I am indebted to Jerry for writing the catalogue as a labour of love, without any honorarium. He visited Hyderabad to study the original paintings first-hand and recheck the text with me. By providing information based on his latest findings, he has made this catalogue into an essential reference book. Jerry also helped me select comparative images from various museums and private collections and obtain high-resolution photographs of them. Key contributions to the formation of this collection of Company Painting were made by the late Stuart Cary Welch (USA); Charles Ewart (London); Narendra Gupta (New Delhi); Kishen Chand Agarwal (Hyderabad); and late Col. R.K. Tandan (Secunderabad). 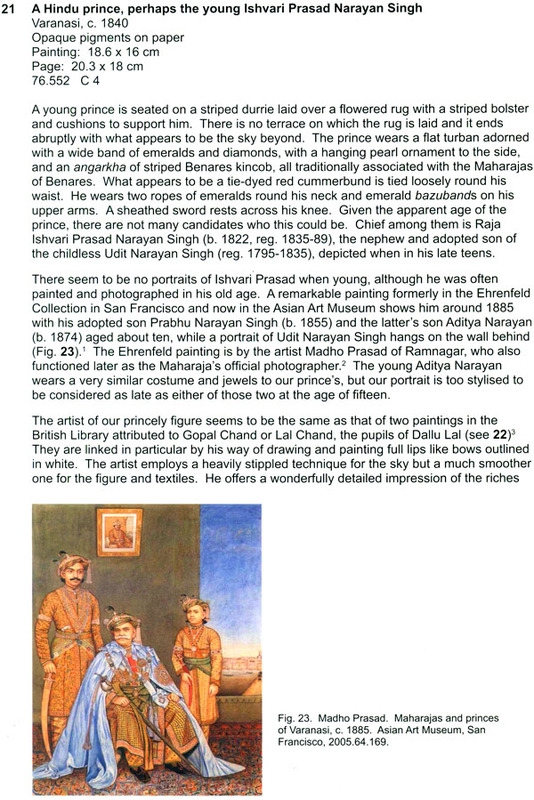 I thank Shri Nitin Bhayana (New Delhi) for bringing to my notice several comparative paintings in the Alwar Museum, Rajasthan, and for providing images of two of these paintings published here; and to Mala Singh, for securing permission to publish two works. 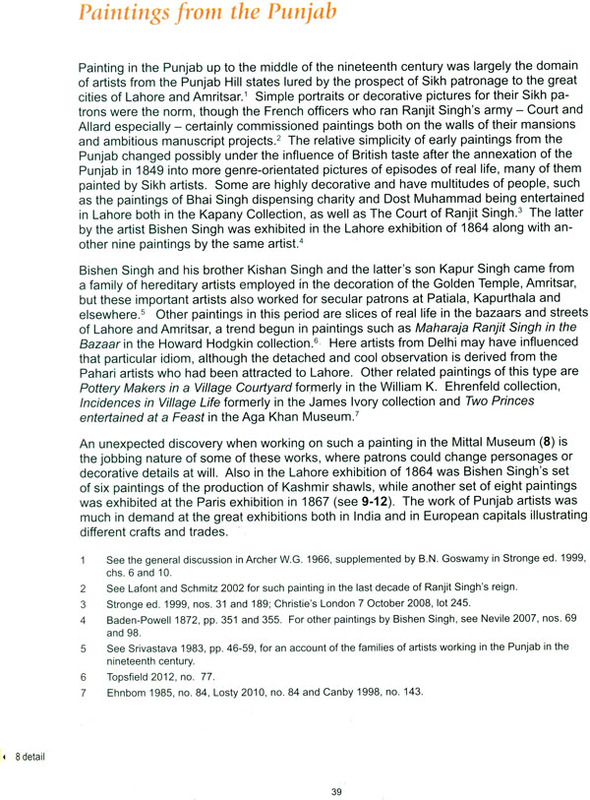 I am grateful to the following for granting permission to publish comparative examples of paintings in their collections: the late Prince and the Princess Sadruddin Aga Khan; Dr. Kenneth Robbins, (Washington, D.C.); Nitin Bhayana; the Victoria and Albert Museum; the British Museum; the British Library; Francesca Galloway Gallery (London); Musee National des Arts Asiatiques - Guimet (Paris); Museum fur Islamische Kunst, (Berlin), The Cleveland Museum of Art (USA); and the Brooklyn Museum, (USA). I appreciate the help of Amy Poster in getting an image of Fig. 11 in the Brooklyn Museum, and Cathy Glynn for Fig. 15 in The Cleveland Museum of Art. I deeply appreciate A. Narayana Rao, who typed portions of this catalogue; T.M. Anirudh, my grandson, for taking exquisite photographs; Kumara Guru, for meticulous image editing; P. Parameshwar Raju, a sensitive graphic artist and Museum trustee, for the elegant book design, and Uma Devi, my granddaughter, for taking some of the photographs and supervising the production; Naveen Kumar, my grandson and CEO of the Museum, for overseeing the timely production of the catalogue; and Radhika Rajamani, for her meticulous proofreading of the text. Special thanks to P. Narendra and his team at Pragati Offset Private Limited, Hyderabad, for their personal attention to the printing process. Our title perhaps needs some explanation. The term 'Company Painting', normally used for all the various styles of Indian painting from the late eighteenth and early nineteenth centuries that show considerable European artistic influence, lumps them all together as if they were related to each other. The term 'Company' comes from the patronage of Indian artists in the colonial period by the officials of the East India Company, but this denies the well-documented involvement of Indian patrons themselves in their patronage of these artists as well as the self-motivation of artists in the development of their art. The term also confuses together all the many styles prevalent in this period, which are as different from each other as Mughal and Rajput painting for example in the seventeenth century. Instead we propose to use the more general term of 'Indian Painting in the British Period' to describe these kinds of paintings. Nowadays in scholarly circles 'cultural assimilation' and 'cross-cultural' studies have become topics du jour, so the time is ripe for a reassessment of this material. For a long time the prevailing view of these styles has been that they are historically 'decadent' as the product of a colonial society, and aesthetically unexciting as a mixture of eastern and western artistic styles. Indeed that has been the predominant view in India itself, largely perhaps since the best paintings left India with the foreigners who commissioned them. Only a few voices have been raised in protest, such as that of Mildred Archer in her various catalogues of the great London collections and of Stuart Cary Welch in his pioneering exhibition in New York in 1978 called Room for Wonder, to which he also added our title as his subtitle. This negative attitude has fortunately not hindered a select number of dealers from discovering new material and enlightened collectors such as Welch himself, Or William K. Ehrenfeld, Prince Sadruddin Aga Khan and Jagdish and Kamla Mittal from acquiring it. It is to be hoped that other Indian collectors will feel emboldened to step into this exciting field. One of the chief characteristics of Indian artists over the past millennium is their openness to different styles. It is not just these artists of the colonial period who have been influenced by foreign styles, but earlier artists also. 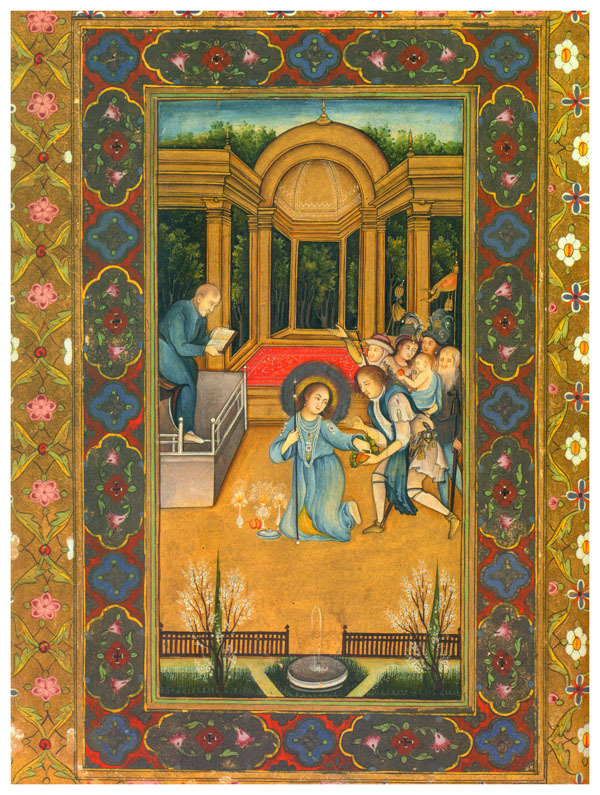 The influence of Persian painting on that of India is obvious in the fifteenth and sixteenth centuries in contributing to the creation of first Sultanate and then Mughal and Deccani painting; and Mughal painting developed the way it did in the late sixteenth and seventeenth centuries, with its increasing concern for naturalism, because its patrons and artists were exposed to and impressed by the art of Europe. Again in the late eighteenth century Indian artists found new inspiration in European art - in figural studies and picturesque painting in particular - which gave them new ways of visualising the Indian world and its inhabitants all around them. Such developments were taking place across north India under indigenous patronage before there were significant numbers of Europeans to influence artists. In later decades these artists were of course patronised by Europeans, but so were they by Indian patrons as we find especially in Lucknow and Delhi. Much of the production in this period was routine as artists churned out albums of trades and buildings as mementoes for Britons of their time in India, which served as photographs or postcards do today. Leaving aside the mass production of such albums, we can in fact see in the best works of this period not only an aesthetically Indian approach to form and composition, but also a select number of artists working at the highest pitch of creativity. The number of paintings of this period in the Jagdish and Kamla Mittal Museum is quite small. The two collectors made no attempt to be comprehensive, to have representatives of all the different styles prevalent at the time, but instead there is the same emphasis on quality and individuality of artistic expression as with the rest of their collection. So this catalogue cannot provide a general introduction to this type of material. Instead the individual catalogue entries attempt to place the painting within the context of that school, while the sectional introductions deal with those parts of the history of the individual schools which are of relevance to the paintings discussed.